Lexie Dunne is a woman of many masks, all of them stored neatly in a box under her bed. 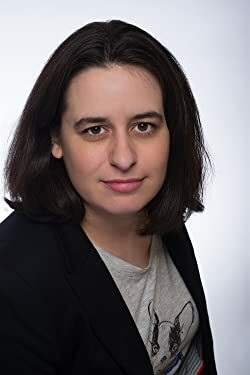 By day a mild-mannered technical writer and by night an adventuress and novelist, she keeps life interesting by ignoring it and writing instead. She hails from St. Louis—home of the world’s largest croquet game piece—and Superheroes Anonymous is her professional debut in the world of caped crusaders, a journey that started when her father took her and her brother to see The Rocketeer. Superheroes Anonymous — (2014-2016) Everybody in Chicago has a “superhero sighting” story. So when a villain attacks editorial assistant Gail Godwin and she’s rescued by superhero Blaze, it’s a great story, and nothing more. Until it happens again. And again. Now the media has dubbed her Hostage Girl, nobody remembers her real name, and people are convinced that Blaze is just her boyfriend, Jeremy, in disguise. Gail’s not so sure. All she knows is that when both Jeremy and Blaze leave town in the same week, she’s probably doomed. Who will save her now? Yet, miraculously, the villains lose interest. Gail is able to return to her life … until she wakes up strapped to a metal table by a mad scientist who hasn’t read the news. After escaping—now more than human herself—she’s drawn into a secret underground world of superheroes. She’ll have to come to terms with her powers (and weaknesses) to make it in the new society, and it’s not easy. After all, there’s a new villain on the rise, and she has her sights set on the one and only Hostage Girl. 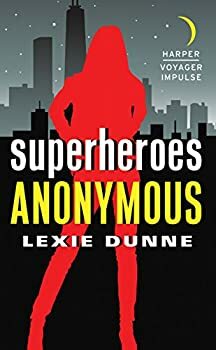 Superheroes Anonymous by Lexie Dunne follows the adventures of Gail Godwin, otherwise known as Hostage Girl, in a world where superheroes and villains exist as celebrities and fodder for gossip websites. A Chicago reporter, Gail — or Girl, as her friends call her — is constantly kidnapped and held hostage by supervillains and subsequently saved by Blaze, one of the most popular heroes. The gossip columnists speculate that Blaze’s identity is Jeremy, Girl’s real-life boyfriend, but she doubts it. However, when Jeremy breaks up with her and moves to Miami, Blaze leaves Chicago for Miami. With no hero to save her, Girl is captured yet again and injected with a serum that gives her superpowers of her own. I really wanted to like Supervillains Anonymous, by Lexie Dunne. The first book in the series, Superheroes Anonymous, was pretty fun and I was looking forward to seeing what happened after its cliffhanger ending, when Hostage Girl (aka Gail Godwin) was falsely accused of the murder of her close friend and superhero mentor, Angelica. Unfortunately, this second installment wasn’t as satisfying as the first; in fact, I found it very confusing and ended up not finishing it.